As seen in The Presidential Visits Series in its entirety: James Monroe to Donald Trump, we’ve chronicled the many presidents who have been to Rochester in various capacities. All the Civil and post-Civil War presidents were covered except Rutherford B. Hayes (1877 – 1881) and Chester A. Arthur (1881 – 1885) who proved exceedingly elusive. Today Michael J. Nighan offers meticulously researched evidence and arguments that Hayes and probably Arthur passed through Rochester, although not in official capacities. We can also add Arthur to the list of presidents who lived in western New York, along with Milliard Fillmore and Grover Cleveland. With the possible exception of apocryphal stories about a young George Washington chopping down a cherry tree, we seldom think about how our presidents spent their childhoods. But in the case of one president, and maybe two, part of their childhood was spent traveling through Rochester. Let’s start with Rutherford Birchard Hayes. Hayes has gone down in history as just another of the string of five Republican Civil War officers from Ohio, starting with General Grant and ending with Major McKinley, who occupied the White House during the last third of the 19th century. in 1876, having lost both the popular and Electoral College vote to Samuel Tilden, Governor New York, Hayes’ supporters charged fraud and challenged the vote count in several southern states. A special congressional committee, comprised of Democrats and Republicans, but stacked in favor of the GOP (plus a sell-out of Tilden by southern Democrats) resulted in all disputed votes being awarded to Hayes, giving him a 185 to 184 victory in the Electoral College, the closest election in our history. Election of 1876. Hayes = Red; Tilden = Blue. Tilden carried New York 51 – 48%. In exchange for the presidency, the deal appears to have been that Hayes (now “Rutherfraud” to his political opponents) and the Republicans would quickly withdraw all federal troops from the states of the ex-Confederacy where they had been protecting the rights and lives of newly-emancipated and enfranchised blacks from their former masters and from the terrors of the Ku Klux Klan. The troops were withdrawn, Reconstruction was ended, and southern blacks began their century-long relegation to second class citizenship in a segregated America. 1855 drawing of Rochester’s two aqeducts, with ruins of first one in the foreground. On June 12, 1834, Hayes crossed the Genesse on the Erie Canal Aqueduct. on board a canal boat Wednesday morning (June 11). Arrived at Schenectady Monday morning. The Hayes’ would have paid 4 cents each per mile for their trip, meals included. Accommodations were far from luxurious given that packet boats, about 70 feet long, usually carried between 60 and 100 passengers, who on rainy days were jammed into a central cabin which also served as a dining hall, being converted to sleeping quarters at night when passengers wedged themselves into three tiers of folding bunks, the overflow having to sleep on the floor or out on deck. Given that the speed limit on the Erie was 4 miles per hour (packet boats, which were hauled by three horses or mules, were usually the only craft that could even reach that speed) the best a boat could do was about 80 miles a day.¹ Although Rochester didn’t rate a mention in Master Rutherford’s journal, their boat would have arrived here some time on June 12, where they would have floated through downtown, crossing the Genesee River on the original (and now long vanished) aqueduct. Built of red sandstone, 802 feet long, 17 feet wide, with 11 arches, the aqueduct was one of the construction glories of the canal until it was discovered that shoddy construction caused it to leak badly, with the result that it had to be replaced within a few years by a new aqueduct which now supports the Broad Street Bridge. Doubtless the Hayes family returned to Ohio by the same route through Rochester, but Master Rutherford’s journal makes no mention of the trip other than stating that they took a canal boat from Schenectady sometime in early October. Although over the next few years Hayes spent a year at a prep school in Connecticut, and two years at Harvard, his journeys to school and home to Ohio were infrequent and he only mentions one trip during which he sailed from Niagara Falls to Oswego via Lake Ontario. After seeing action as a brevet major general in the Civil War, Hayes entered politics and was serving his second term as governor of Ohio when his next journal entry (yes, he was still keeping a journal and would for the rest of his life) relating to a trip through Rochester, again without mentioning the city by name, pops up. Datelined Albany, July 11, 1871, he stated that he’d left Ohio the day before and had traveled from Buffalo, obviously by train and almost certainly through Rochester. The last indication of a trip by Hayes through, if not to, Rochester came in 1884 when he noted in his journal for Sept. 10 that he had returned home from a two week stay in Saratoga, “Wednesday evening. 10:00 P.M., left Saratoga …via Schenectady and Buffalo…” As before, no mention of Rochester, but the near certainty that his train took him through the city. 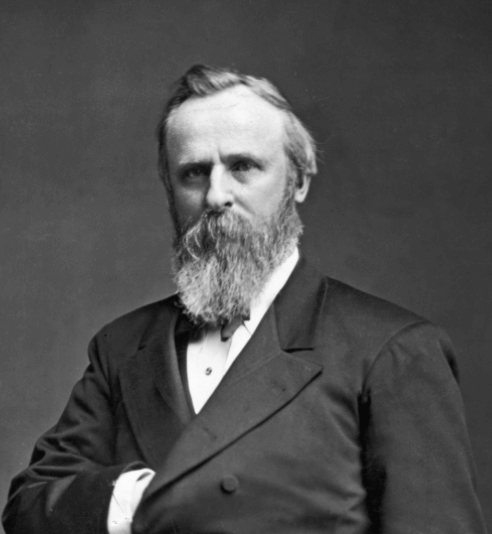 The linkage between Rochester and President Chester Allan Arthur in his younger days is far more tenuous and problematic than the connection between Rochester and Rutherford Hayes. Nominated to run as James Garfield’s vice president² by the so-called “Stalwarts” at the 1880 Republican national convention, Arthur was the epitome of the political insider and party hack. Taking office in March 1881, and planning on spending a few years in the peace and quiet of the job described by John Adams as, “the most insignificant office that ever the invention of man contrived or his imagination conceived”, Arthur was stunned to find himself within a few months elevated to the presidency following the assassination of Garfield. Born in Vermont, the son of an impoverished minister who spent his career moving from one church to another, few would have guessed that Chet Arthur would become the suave and urbane politician of later years, a New York City bon vivant, an impeccable dresser known to change clothes several times a day and to spend an hour or more brushing his luxurious side whiskers. The little we know about Chet’s family travels in western New York State boils down to this. A fire and brimstone preacher, and a fervent abolitionist at a time when such views were in a decided minority, the Rev. William Arthur appears to have worn out his welcome on a regular basis, necessitating moving on to find new congregations to minister to. In April 1835, Rev. Arthur and his family, including five year old little Chet and his five siblings, moved from Vermont to Perry, NY where he served as pastor until September 1837. They then moved a dozen miles down the road so the reverend could preach at a church at York in Livingston County. In the fall of 1839, having been offered the munificent sum of $500 per year, Rev. Arthur and his family left York and moved east to the Bottskill Baptist Church in Greenwich, near Saratoga Springs. During the Arthur’s sojourn in western New York, a son, George, was born to Rev. and Mrs. Arthur in Perry on May 24, 1836. 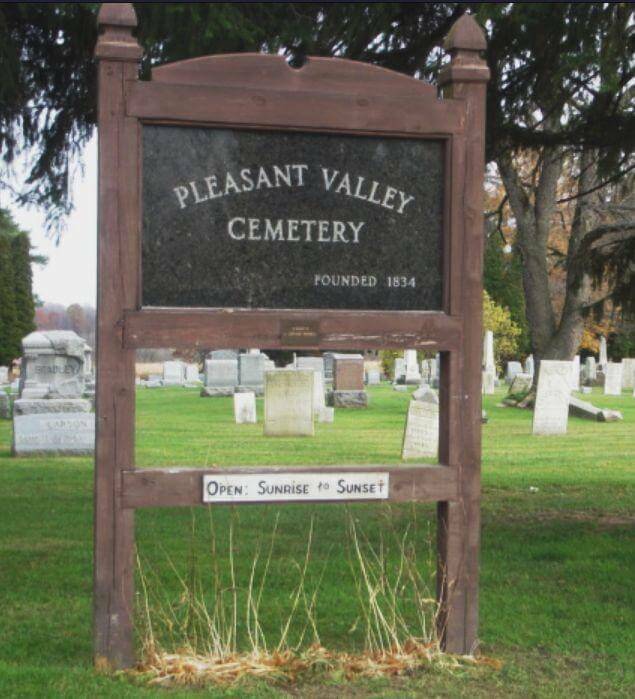 Sadly, he died two years in York and is buried in the Pleasant Valley Cemetery in Piffard. So here’s the Big Question. What route did Chet Arthur and his family take to get from Vermont to Perry, and from York to Greenwich? I see three possibilities. Either they took the Erie Canal west to Rochester and then traveled south by wagon or stage coach. 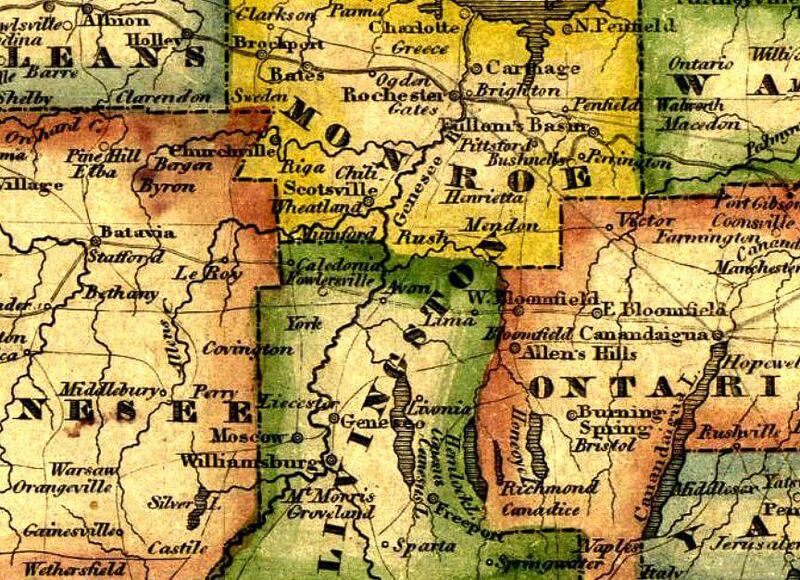 Or they took a wagon or stage coach all the way via the precursors to Routes 5 and 5/20 south of Rochester. 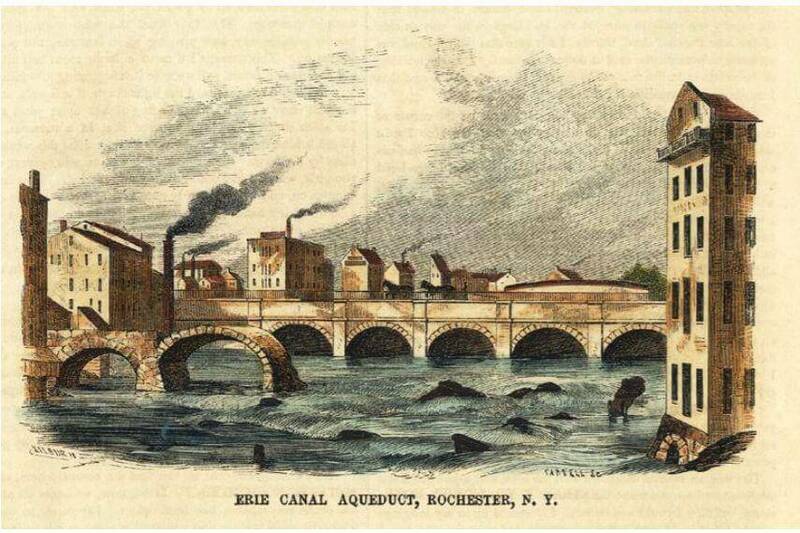 Or they took some combination of canal and roadways that could have bypassed Rochester altogether. 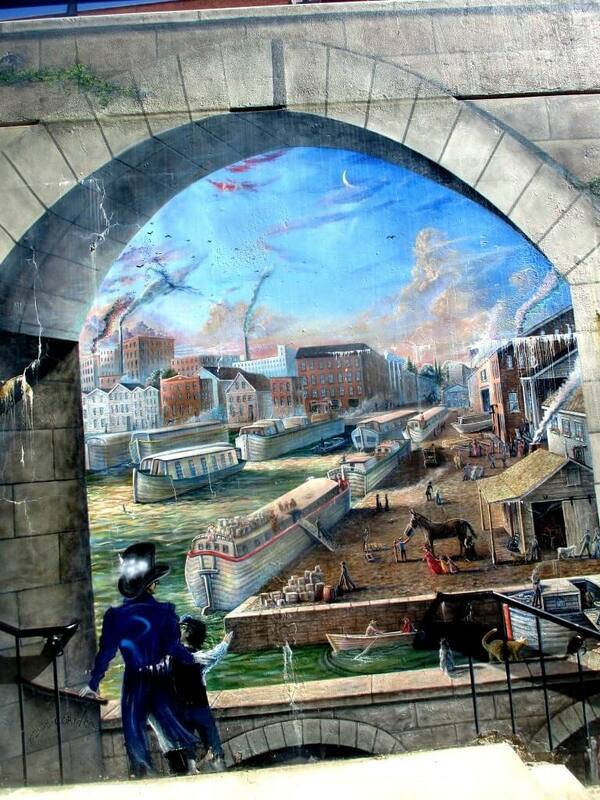 My vote is for the first alternative, a direct trip by canal to Rochester and then south by wagon or stage. Then Reversing the trip when they subsequently left the area a few years later. Although this view is based on nothing more substantial than conjecture, let me lay out my thought process. The leading “travel guide” of the day was J&J Harper’s “The Northern Traveler and Northern Tour” (1831) which focused on travel from east to west across the state via the Erie Canal. In addition to discussing travel tips while negotiating for his new job, it would be likely that Rev. Arthur would have consulted such a guide. And even a small amount of research would have disclosed the fact that the road conditions west of Albany for wagons and coaches was still abysmal in the 1830s. Admittedly there are many variables that could have determined how the family would have traveled from Vermont to Perry, and later from York to Greenwich. For instance, we have no idea how much furniture, if any, they took when they moved. And I can’t find much on relative costs of travel by wagon or stage coach versus travel by the Erie Canal. I suspect that travel by wagon would probably be cheaper, but far slower and far tougher on a family with small children. We do know that they could have traveled on a passenger and freight canal boat for about 1 cent per mile per person. The big problem for researching this is that, upon his death Chester Arthur had his executors burn many of his papers. And those scraps that have been gathered by the Library of Congress over the years don’t include any relating to his father and nothing older than 1843. Additionally, perhaps the Arthurs could have traveled to the “big city” of Rochester during their several years in Perry and York just to see the sights. But that’s a virtual impossibility to ever prove. Election of 1880. Garfield/Arthur = Red; Hancock/English = Blue. Hancock carried New York 51 – 48%. 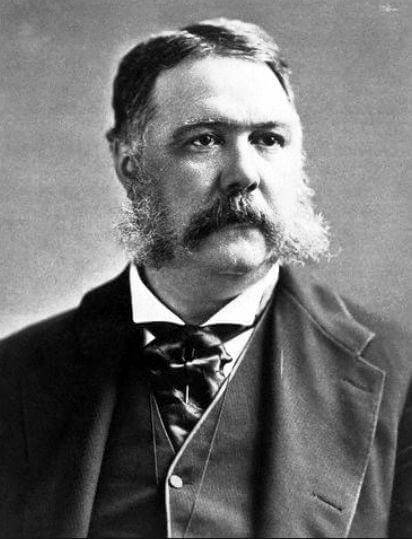 Chester Arthur later traveling in western New York west of Syracuse or east of Buffalo, including when he was running for VP under Garfield in 1880. An interesting connection between Arthur and Hayes is that, even when the Republicans held their state convention in Rochester in 1877, Arthur, a federal employee at the time, serving as Collector of the Port of New York, stayed home in New York City, claiming that he was acting on orders from President Hayes. Those who knew Dr. Arthur will remember him as unswerving in his devotion to whatever he deemed to be right…he leaves two sons, one of whom is Gen. Chester A. Arthur ³…Gen. Arthur, when the family resided in York, was a lad of ten or twelve years (sic), and has not been forgotten by those who were then his associates. 1. 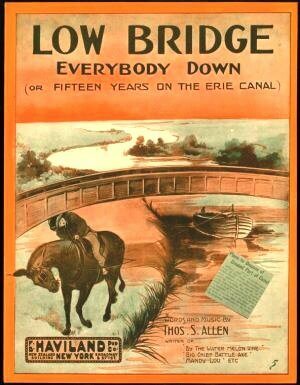 As a side note, the archetypal Erie Canal song, “Low Bridge! – Everybody Down (or Fifteen Years on the Erie Canal) “was written between 1911 and 1912 by Thomas S. Allen, who was leading the orchestra at the Victoria Theater in Rochester at the time. Allen later claimed that he’d never seen the canal or heard the phrase, “low bridge” until he moved here. 2. As a point of extreme triviality, Arthur was Garfield’s 6th cousin, 1 time removed. 3. At the beginning of the Civil War, Arthur had been made a brigadier general in the state militia’s quartermaster corps, far more a political patronage appointment than an actual military command. To the surprise of many, he was a well-organized and effective administrator.